Looking for a more efficient way to load multiple rounds into your SKS Carbine rifle? First, load the stripper clip with ammo by hand or with a clip guide. Next, check that the rifle’s safety is on. With the bolt locked to the rear on an empty magazine, insert the stripper clip into the grooves in the charging handle. With your fingers at the base of the rounds, push the rounds down. Keep the stripper as vertical as possible. Gently but firmly push the stripper clip down as far as it will go until it bottoms out in the magazine. Gently apply downward pressure with your thumb on the uppermost round to release them from the clip. 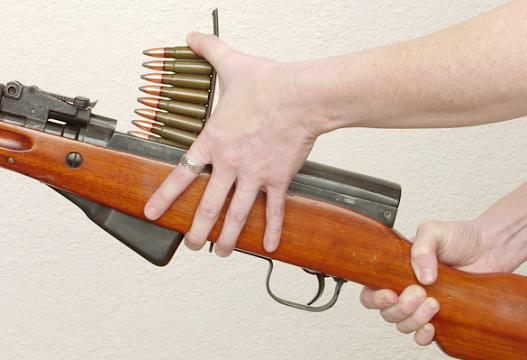 The ammo should easily begin to slide down the stripper clip into the magazine. If the ammo doesn't slide easily, DON'T FORCE IT. Remove the stripper clip and examine it and the ammo for possible damage. Once all rounds have been pushed into the magazine, remove the stripper clip and put it in a safe place to use again later. 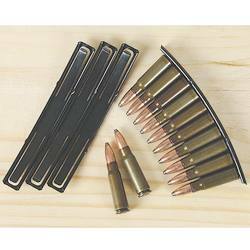 Stripper clips let you quickly load ten rounds into your SKS, but what about those times when you need additional ammunition at hand? You want a fast, reliable system with quick reloading and durability even under the harshest conditions. An SKS Buttstock Pouch from Strike Hard Gear is an excellent clip carry solution that carries the extra rounds that may help you get the big game. 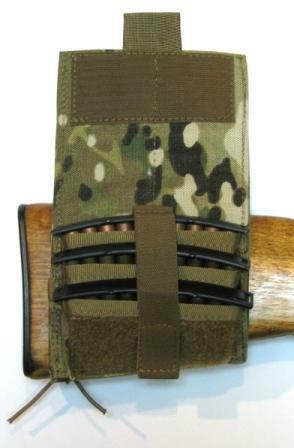 The SKS Buttstock Pouch lets you attach 3 SKS stripper clips securely to the buttstock of your SKS rifle! The lacing system fits both the bottom swivel rifles like the Russian and Yugo or the side swivels style like the Norinco SKS, and accommodates left or right side mounting. Make an investment you can count on today - one that's sure to help you beat the odds, get the buck, or hit the target again and again! Remember Strike Hard Gear's “No Questions Asked” 30-Day Money-Back Guarantee AND the Lifetime Replacement Warranty: it’s a NO-RISK option for top quality gear!